Abhisamayalankara (Skt. Abhisamayālaṃkāra; Tib. མངོན་རྟོགས་རྒྱན་, Ngöntok Gyen, Wyl. mngon rtogs rgyan; Trad. Chin. 現觀莊嚴論), The Ornament of Clear Realization — one of the five treatises that were directly revealed to Asanga by the future Buddha Maitreya, it is a commentary on the hidden meaning of the Prajñaparamita Sutras, describing the entire journey of the bodhisattva, from the generation of bodhichitta to the attainment of full omniscience. It is included among the so-called "Thirteen great texts", which form the core of the curriculum in most shedras and on which Khenpo Shenga provided commentaries. These eight topics are further divided into seventy points. 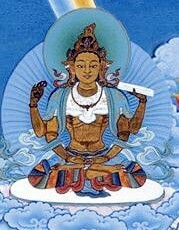 In his commentary on the Abhisamayalankara Mipham Rinpoche says that among the texts in the Tibetan Tengyur related to the prajnaparamita, there are twenty-one Indian commentaries on the Ornament of Clear Realization. English translation: Commentary for the Ornament (abhisamayālaṅkāra vṛtti, in Abhisamayalamkara with Vritti by Arya Vimuktisena and Aloka by Haribhadra, translated by Gareth Sparham, 2005. 4. Haribhadra, Eight Chapters on the 25,000, (shes rab kyi pha rol tu phyin pa stong phrag nyi shu lnga pa). This text comprises three volumes in the Tengyur. English translation: Light for the Ornament: An Explanation of the Perfection of Wisdom (Abhisamayālaṃkārā lokā prajñā pāramitā vyākhyā), in Abhisamayalamkara with Vritti by Arya Vimuktisena and Aloka by Haribhadra, translated by Gareth Sparham, 2005. 7. Haribhadra, Illuminating the Meaning, Sphutartha (Skt. Sphuṭārthā; Tib. འགྲེལ་པ་དོན་གསལ་, Wyl. 'grel pa don gsal, or more fully shes rab kyi pha rol tu phyin pa'i man ngag gi bstan bcos mngon par rtogs pa'i rgyan zhes bya ba'i 'grel pa). མངོན་རྟོགས་རྒྱན་གྱི་འགྲེལ་པ་དོན་གསལ་, mngon rtogs rgyan gyi 'grel pa don gsal. Mipham Rinpoche tells us that Haribhadra composed this commentary after having received a prophecy from buddha Maitreya. This became the most famous commentary in Tibet. 8. Dharmakirti of Suvarnadvipa, Light on the Difficult-to-Comprehend (mngon par rtogs pa'i rgyan zhes bya ba'i 'grel pa rtogs par dka' ba'i snang ba zhes bya ba'i 'grel bshad), which is a sub-commentary on Haribhadra's Sphutartha. 9. Dharmamitra, Explanatory Commentary Clarifying the Words (Skt. Abhisamayālaṅkāra kārikā prajñā pāramitopadeśa śāstra ṭīkā prasphuṭa padā, Tib. shes rab kyi pha rol tu phyin pa'i man ngag gi bstan bcos mngon par rtogs pa'i rgyan gyi tshig le'ur byas pa'i 'grel bshad tshig rab tu gsal ba), which is also a sub-commentary on Haribhadra's Sphutartha. 19. Prajnakaramati, Essential Meaning (mngon par rtogs pa'i rgyan gyi 'grel pa'i bsdus don), which is also a sub-commentary on Haribhadra's Sphutartha. 21. Mipham Rinpoche gives the text as Düpé Damngak (sdud pa'i gdams ngag), but Khenpo Tsondru says it is Abhayakaragupta's Munimatālaṅkāra (Tib. thub pa'i dgongs pa'i rgyan, Toh 3903). The later text is, unlike all the other twenty texts, not found in the prajnaparamita section of the Tengyur but the madhyamaka section. Abhisamayalankara, Edward Conze (Rome: Is.M.E.O., 1954). Ornament of Clear Realization: A Commentary on the Prajnaparamita of Maitreya, Thrangu Rinpoche, Zhyisil Chokyi Ghatsal, 2004. ↑ This is also verse 7 of Nāgārjuna’s Heart of Dependent Origination. Dzigar Kongtrul Rinpoche – Rigpa Shedra West, Dzogchen Beara, 2003. Dzogchen Rinpoche – Rigpa Shedra West, Dzogchen Beara, 2004. Khenpo Jampal Dorje – Rigpa Shedra West, Lerab Ling, 2005. Khenpo Sönam Tobden - Rigpa Shedra East, 4 January to 30 April 2011. This page was last edited on 24 April 2018, at 00:54.